With March for Men on Sunday 25 March set to raise money for men's health treatment at the Royal Bournemouth Hospital, one participant explains why he is giving back to his local hospital. Gordon Youngson knows how important it is to be there for family. As a loving father and grandfather, nothing matters more to the 66-year-old from Bournemouth than being a source of strength and comfort to his loved ones. But when Gordon was blindsided by a bladder cancer diagnosis in November, the men in his family quickly rallied around to support him. Gordon underwent a transurethral resection of a bladder tumour (TURBT) procedure, but during a follow-up meeting with his consultant, Gordon received the frightening news that no patient ever wants to hear. “My wife and I were given the devastating news that I had stage-III cancer of my bladder with secondary cancer having spread to my liver,” he explains. With hardly any time to process the situation, Gordon was immediately started on a course of chemotherapy, which he is still undergoing today. But despite facing such difficult circumstances, there has been good news for Gordon and his family. 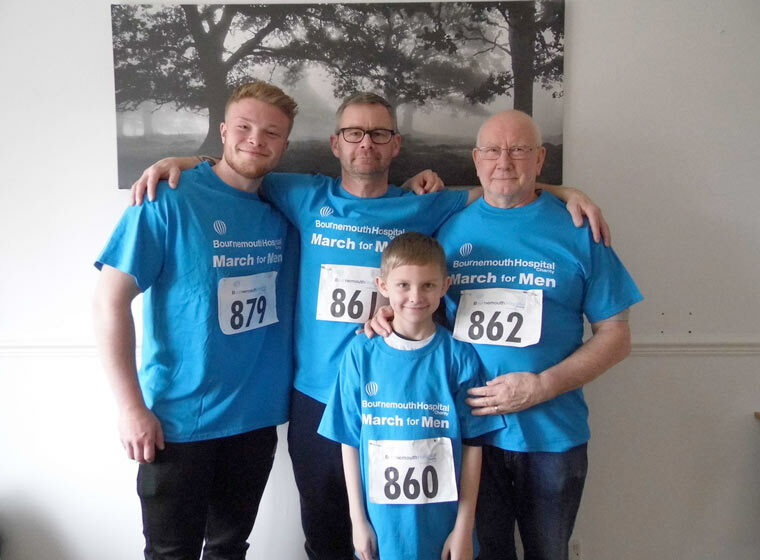 As a men’s health patient himself, he had decided to champion this major aspect of local health care by taking part in Bournemouth Hospital Charity’s March for Men on Sunday 25 March and raise money towards improving men’s health treatment at the Royal Bournemouth Hospital. “I’m supporting March for Men, as it is my way of giving something back for the excellent care that I have received ever since my cancer diagnosis,” he explains. Gordon will not be alone as three generations of Youngson men will be walking side-by-side for men’s health on 25 March. In his ‘team’ are son Stephen, grandson Bailey and grand-daughter’s boyfriend Paul. Since 2014, March for Men has raised nearly £80,000 for men’s health treatment at the Royal Bournemouth Hospital. Anyone – fathers, husbands, sons, uncles, friends and well as their loved ones – can sign up to take part in March for Men at BHCharity.org/m4m/ or by calling 01202 704060. Entry is £15 for adults (over-16s), £8 for ages 5-15, while under-5s go free. Gordon and all the Youngson men urge others to join them at Bournemouth Pier Approach on 25 March and show their support for all men’s health patients in the community.